After a fulfilling Hawaii vacation, many visitors leave with happy memories, tons of pictures, and, sometimes, a bad sunburn (ouch!). But, how about bringing home a considerable amount of knowledge about Hawaii culture and art? Now, THAT’S a vacation! Hawaii’s museums are a treasure-trove of cultural artifacts, art, documents, photos, and exhibits. And, visitors who take the time to explore them often feel they leave with a more complete understanding of Hawaii’s people, land, and culture. The Bishop Museum is Hawaii’s museum of natural and cultural history. It was originally designed to house the extensive collection of Hawaiian artifacts and royal family heirlooms of Princess BernicePauahi Bishop. The Museum has since expanded to include millions of artifacts, documents and photos about Hawaii and other Pacific cultures. Daily programs allow visitors to discover more about Hawaiian and Polynesian cultures through live, interactive presentations and exhibit tours. Visit Oahu’s Honolulu Museum of Art-Spalding House (formerly known as the Contemporary Museum) for a stimulating look at the Museum’s outstanding art collection and a light lunch at its gourmet cafe. The dramatic Mount Tantalus serves as the backdrop for the Museum’s artist gardens and outdoor exhibits of contemporary art. Located in Downtown Honolulu across the street from the Iolani Palace and State Capitol, the Hawaii State Art Museum Hawaii (HISAM) is dedicated to exhibiting and interpreting the art and culture of Hawaii. The museum is comprised of three spacious galleries, an outdoor tiled lanai, a 70-seat multi-purpose room and a volunteer resource center. Located near Downtown Honolulu, the Honolulu Museum of Art (formerly known as the Honolulu Academy of Arts) was chartered in 1922 by Mrs. Charles Montague Cook (Anna Rice), who desired to share her love for the arts with the children of Hawaii. Since the doors opened on April 8, 1927, the Musuem has steadily grown to become Hawaii’s largest private presenter of visual arts programs, boasting a permanent collection of over 38,000 works of art from cultures around the world. From the Museum of Art you can also take a tour of Shangri La, one of Hawaii’s most architecturally significant homes. [haw]Iolani[/haw] Palace is the only the only official state residence of royalty on U.S. soil. Journey through the times of happiness and tragedy of King Kalakaua and Queen Liliuokalani as you view their two-story American Florentine style palace. Iolani Palace is the only royal residence on U.S. soil. Take an escorted historical walking tour into the life and work of the Protestant missionaries who settled in Hawaii in 1820. The site displays three original frame homes that were built in New England and shipped to Hawaii to house the missionaries. Nearby, you’ll see the island’s original schoolhouse and the printing house where the first alphabet book and Hawaiian hymnal were printed. 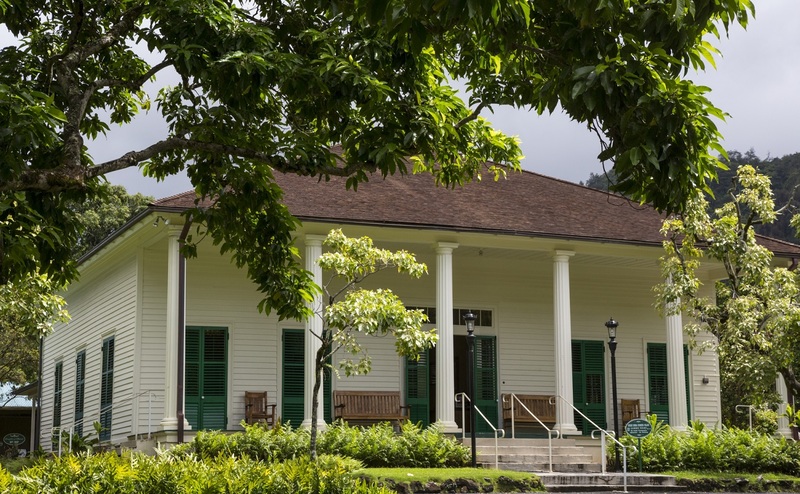 Located on the drive to the Nuuanu Pali Lookout, the Queen Emma Summer Palace was the secluded summer retreat of Queen Emma, King Kamehameha IV and their son, Prince Albert. Following the tragic death of the 4-year old prince in 1862 and the king in 1863, Hawaii’s Queen lived a life of mourning at the Palace. Inside, you can find royal antiques and furnishings stand in their original places, including the koa wood cradle of Prince Albert and gifts from his Godmother, Queen Victoria. Located in Central Oahu, escape the present day and explore Oahu’s plantation heritage and culture at the Hawaii Plantation Village in Waipahu. You’ll learn how more than 400,000 immigrants who arrived between 1852 and 1947 to work on Oahu’s plantations actually shaped Hawaii into the vibrant multiethnic community it is today. Named for the pearl oysters once harvested there, Pearl Harbor, located in the Ewa District of Central Oahu, is the largest natural harbor in Hawaii and the only naval base in the United States to be designated a National Historical Landmark. Explore the living museums of one of Oahu’s most well known landmarks at the Pacific Historic Parks, the Battleship Missouri Memorial, the USS Bowfin Submarine Museum and Park, the Pacific Aviation Museum, and the USS Oklahoma Memorial. If you take the time to exlore Oahu museums during your Hawaii vacation, you can bring home a better appreciation for Hawaii’s people, culture, and contributions. The best part? The knowledge you’ll gain doesn’t take up any space in your suitcase!